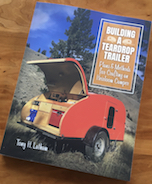 Hey guys I'm getting very close to being able to start skinning my teardrop and realized I'm not totally sure what to skin my trailer with! So to the web I went, only to find that there really isn't a post with the information I have been looking for. Basically I would like to know what works best (for a fairly cheap price) and how you would mount it to the camper. Thanks in advance for the help. For what its worth I have found an excellent skinning option that is inexpensive, fairly easy to apply, durable, seamless, waterproof, repairable and can be any color. They call it "Poor man's fiberglass" Found a thread on this site a few years ago and used it on my build. 1/8 Plywood base, Titebond 3 waterproof glue, painters drop cloth canvas (spread onto wet glue and rolled out with rolling pin), 4 coats of premium acrylic exterior paint. Worked so well I built a 10ft plywood Jon boat this spring using the exact same method. phazermike wrote: For what its worth I have found an excellent skinning option that is inexpensive, fairly easy to apply, durable, seamless, waterproof, repairable and can be any color. They call it "Poor man's fiberglass" Found a thread on this site a few years ago and used it on my build. Not to Hijack the thread, but need some confirmation. You do NOT use "the mix" before PMF'n correct? The TB wont adhere to the ply if I understand correctly??? I just skinned my trailer using pmf. I first sanded down all the plywood on mine and filled in low spots with great stuff(I do not recommend this stuff at all). I then poured the Titebond II into a paint roller pan and used a roller to apply the glue to a side. I then took a sheet of drop cloth material and adhered it to the glue using a scrap piece of 2x4 to help smooth out any wrinkles. The last application I added the roof drop cloth which rolled over the side edges and across the front. After everything dried 1 day of 75-80 degree weather. I started the paint using a roller until everything was saturated. About 3 coats have been applied. Paint I used is exterior latex one coat paint. But if I were looking for an alternate skin, I'd also look at fiberglassing––it's not difficult––followed by a colorful bed liner. It's been done on here and makes for a fine looking and protected 'drop. Thanks! I have already done the sides, I did use the big box store canvas. Shrunk it at the laundromat and ironed on the dining room table. Went well enough and pretty smooth, no ironing on the trailer. Got a couple coats of primer on and working towards the exterior coats. I did just order the canvas from bigduck for the hatch as that is the part I want to turn out looking as good as possible. Thanks for the info, I wish I would have looked harder for a supplier It would have been nice to order all from them. Im happy with how the cheap canvas is progressing, so looking forward the using theirs. What is Big Duck? Is it an online store? davidAndshannon wrote: What is Big Duck? Is it an online store? Sure is, way better quality canvas than the box store drop cloth. I bought the preshrunk http://www.bigduckcanvas.com/10-oz-cott ... s-natural/ I did my sides with the box store and my rear hatch with the stuff from big duck. Huge difference. I also used different paint on the rear hatch, oil based topside paint. Used sand able filler primer on the rear as well. Sides I went latex exterior paint.